The Memory Jacket was a hit! 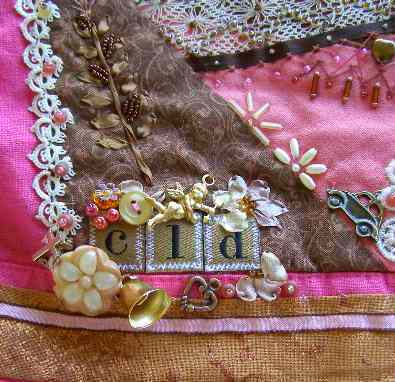 My mother was thrilled with it and spent quite a bit of time trying to identify each of the embellishments. The center back panel was crazy quilted and heavily embellished. The lower right back waistband has the seven hearts. The collar detail shows the intricacy of the beautiful pink tatting from The Stash. Panels below the front jacket pockets were also crazy quilted and embellished. Individual lace motifs were placed on the buttonholes. Vintage buttons replaced the original plain pink buttons. Lace and other embellishments were also added to the cuffs and lower sleeves. Seven Hearts and a fly! The seven hearts represent my mother’s ability to cut a pie into seven equal pieces! No small achievement as we were all hoping for that one piece that was slightly bigger! On the heart furthest to the right is a fly (a button shaped like a housefly). We were forever leaving the door open and “letting in that fly!” She would get the fly swatter and go on the hunt! There is a pair of scissors above that heart – representing the “good sewing scissors” – which as anyone that grew up in a sewing household knows are the scissors NOT to be used for anything but fabric! My mother drove a VW bug for years. Snow, ice, blizzards, over hill and dale to college and work. That little yellow VW bug went everywhere! I was thrilled to find a VW charm to add to the jacket. 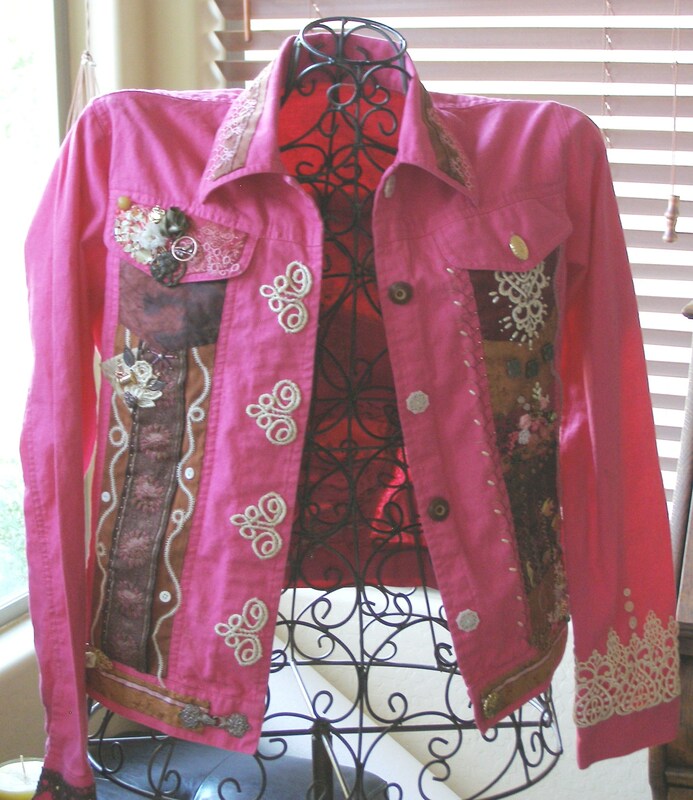 This entry was posted in Crazy Quilting, Embellishment, Goddess, Sewing, Stash Couture. Bookmark the permalink. 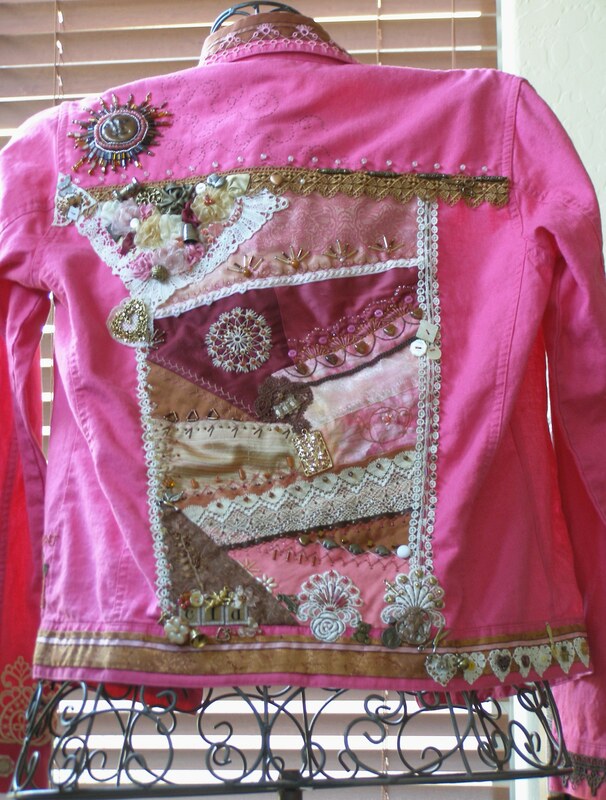 That is a great idea to make a spring jacket to look forward to wearing. I seriously love this idea! Fabulous work! What a great idea and the jacket is amazing. Such a treasure to own! I’m sure your mom will get tons of compliments on it and have so much fun finding all the little treasures hidden on it. Your mother and mine sound like twins – regarding scissors and VW driving. We children did not ever get accused of “letting in that fly!” , but rather were asked a question “were you born in a barn?” The person who cut the pie got the final piece, so it was in a person’s best interest to cut even-sized pieces.